The last 12 months has seen Handypiece sheep shearing handpieces go from strength to strength. David Short, Managing Director of Handypiece says “Finally farmers are getting the sort of money for their sheep that they truly deserve.” The spin off from that is that now farmers are happy to invest in quality capital farm equipment like Handypiece sheep shearing handpieces to keep their stock clean and healthy. Since winning the major award for innovation at the Sheepvention 2009, about 1000 Handypieces have been sold in Australia and New Zealand. In 2010 Handypiece received an award for the best improvement for equipment used for wool harvesting and shearing. The award was a result of development surrounding purpose-designed Lithium batteries, to be sold as an optional extra. Handypieces are designed around traditional Handpieces. So they are slim in the hand. And, since they use 12V, they can be carried anywhere on the farm. They are ideal for keeping in the vehicle in times of fly strike, though their main use is butting sheep up a race. They have a sealed 12V electric motor with direct drive (attached to the back) which may be used in the wet. This is unlike all other portable electric clippers that run a high speed motor through a gear box, which creates heat from friction and wear as the gears work together. Although suited to lifestyle and small block holders, 95% of Handypiece sales have been to large scale farmers. If a large farm has satellite yards located at the back of the property, the Handypiece makes it possible to clean up all the stock, without having to tire sheep and the farmer by trekking long distances back to the shed. The rechargeable 7Ah battery provides enough power for about 120 sheep crutchings. There are two batteries in the kit so it can handle up to 240 sheep, depending on how dirty they are. After that, there is the option of plugging in the 5m extension cord to a quad, Ute or any other 12V supply. It has a reset fuse for overload or lockup. 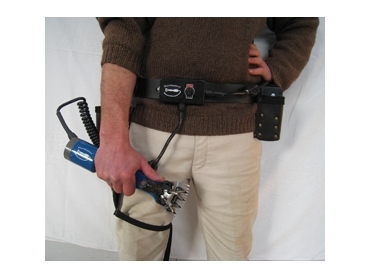 The kit also comes with a battery charger, belt, holster and pouch. These items are all made of heavy duty leather, completed with a purpose-designed carry bag. With the recent announcement regarding the closure of the Supershear (Ex. Sunbeam) factory in Australia, Handypiece Holdings Ltd has successfully secured a supply of quality Lister Handpieces, which in turn will become the new green Handypiece kits. The silver lining to this cloud is that they are now 120g lighter.